It pays to listen to your father, especially if you are Cheteshwar Pujara. 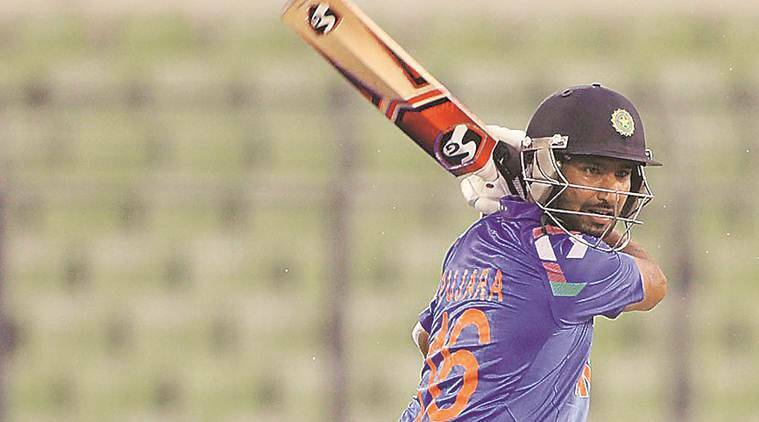 A day after his father told him to use the crease better by going forward or back to attack in T20, Pujara followed the advice to stun everyone, barring his papa of course, with a 61-ball hundred in the Syed Mushtaq Ali T20 tournament. Just run through the stats again: 61 balls, 14 fours and a six, though it came in a losing cause. “Papa had said day before the match to that how I can use my batting crease in T20 format. And the reason especially in this format, bowlers are always under pressure because they have to experiment something. So if you can pick that ball early by using the crease (by either going forward or back) you can pick the bowlers length early and you can play the shots better,” Pujara told The Indian Express. Pujara wants to let his bat do the talking for him. “It’s my job to score runs. I don’t want to be playing to shut critics’ mouth. People are now appreciating what I am doing. They also know that I am capable of playing white ball. If runs come like this, people will realise that Cheteshwar Pujara is not about only Test cricket but he can play other formats of the game as well. People will now know that if I can score 100 in 60 balls that is what require in the shorter format,” says. With the white ball hardly swinging much, batsmen have the liberty to hang back in the crease and let his arms flow through the line of the ball. Pujara reportedly did just that against Railways. Pujara says that he played his shots from the first ball and drew comparisons with New Zealand’s Kane Williamson. “I am a batsman who plays very similar to someone like Kane Williamson (New Zealand captain), who plays proper cricketing shots. In this format I had nothing to lose, I just need to express myself. I don’t have to do anything extra, like reverse sweep unless the situation demands for it. At this stage, if I’m scoring like this then why I need to change my game,” he said. Pujara has been working on adding a new shot to his batting and was working with his father and coach Arvind Pujara in Rajkot after the Ranji final. Pujara doesn’t want to reveal much about his shot and approach but says it’s the confidence that has taken his batting to a different level these days. That he is picking the length earlier than before. The runs in Australia have done the trick. “When you are in good form especially in Test cricket when you have batted well, you see the ball early and then here (in T20) you don’t have any fear of getting out, you can start playing your shot from ball one. You tend to read the bowlers earlier, even the length judgment happens a touch early,” Pujara said. He says his batting form and the small adjustments with few extra added shots have helped him to execute better. Due to his international commitment, Pujara hasn’t played many T20s for Saurashtra and his confidence has come in right time for his state team. These runs probably came a bit late for Pujara as he won’t be featuring in the IPL this season. Instead, he will look to spend the summer in England with a county team. Brief Scores: Saurashra 188/4 (Cheteshwar Pujara 100, Robin Uthappa 46) lost to Railways 190 for 5 (Mrunal Devdhar 46, Pratham Singh 40) in 19.4 overs. Meanwhile, Shreyas Iyer struck a 55-ball147 to help Mumbai crush Sikkim by a whopping 154 runs in their Group match. Brief Scores: Mumbai 258/4 (Shreyas Iyer 147, Surya Kumar Yadav 63; Milind Kumar 2-30) beat Sikkim 104/7 (B B Sharma 32; Shams Mulani 2-2, Shardul Thakur2-13) by 154 runs.